Students are introduced to the geography and earliest civilizations of the Americas by looking at a map. They learn how the Americas were originally populated and where the earliest civilizations developed. Then, they focus on the Olmec civilization‚Äîthe earliest civilization in the Americas. Finally, they compare the emergence of civilizations in the Americas with those in the four early river valley civilizations. In this experience, students are introduced to the geography and earliest civilizations of the Americas by looking at a map. They learn how the Americas were originally populated and where the earliest civilizations developed. Then, they focus on the Olmec civilization—the earliest civilization in the Americas. Finally, they compare the emergence of civilizations in the Americas with those in the four early river valley civilizations. In scene 4, students compare and contrast the emergence of civilizations in the Americas with the four early river valley civilizations. One of the best ways to have students complete this scene is to have them review the experience Emergence of Civilizations in River Valleys. The Student Pack contains a background article that students can use to help complete the comparison. 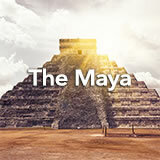 Locate and describe the physical geography of earliest civilizations in the Americas. Describe the earliest civilizations in the Americas. What’s the farthest trip you have ever gone on? It’s probably not as far as the migration of the earliest residents of the Americas. You’ll see why in this experience! Look at this map of the Americas. Label countries and bodies of water that you can locate. Discuss what students were able to label. Now look at this map to see what you labeled correctly. You may return to your map now and add details. List at least one thing you know about the geography and early civilizations of the Americas. If someone has already listed the fact that you know, try to think of a different one to post. Discuss students lists. You may hear a number of misconceptions from students; for example, some may think that when the Europeans arrived, there were very few people living in the Americas. You don’t have to correct these misconceptions now because students will learn more in this experience. However, you might want to highlight facts they name and ask them to look for information that may confirm or refute that information. 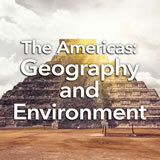 What questions do you have about the geography and earliest civilizations of the Americas? Use student questions as a guide for how to focus discussion throughout the experience.